My cookbook of choice this holiday – to read, explore, focus on, and experiment with – is the rebar modern food cookbook by Audrey Alsterberg and Wanda Urbanowicz. Today for lunch I decided to experiment with the rebar Cesar Salad which is not a vegan salad but I veganized it to see what it would taste like. It was a highly successful lunch. 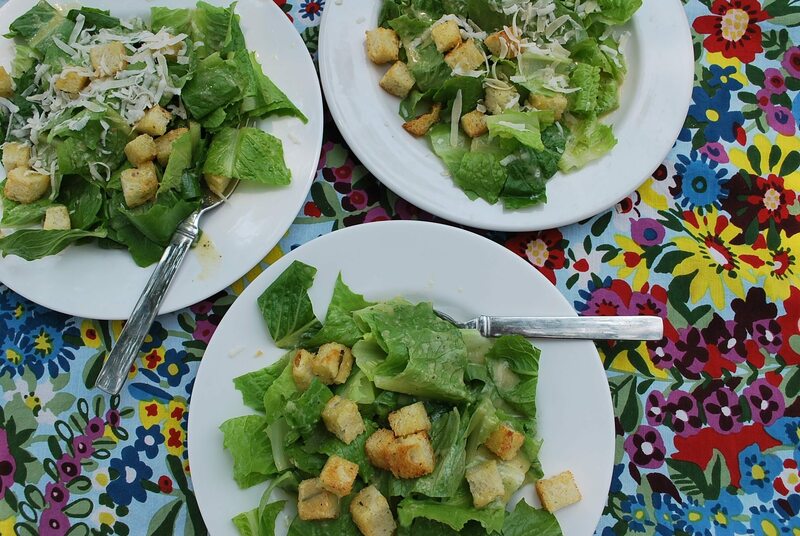 Who needs cheese, anchovies, and bacon when you’ve got roasted garlic, local romaine lettuce, and homemade croutons? Not me! Andrew and Bekah decided they wanted shaved parmigiano on theirs; I went without. We were all super satisfied. To serve, toss the dressing with washed, dried, and torn romaine lettuce and fresh croutons (see below), and garnish with shaved parmigiano (optional), fresh cracked pepper, and lemon wedges. Enjoy! Preheat oven to 400 degrees. Using a sharp knife, slice the top off the garlic bulb, just enough to expose the tops of the garlic flesh. Center bulb on a square piece of parchment paper. Drizzle with olive oil and sprinkle with salt and pepper. Pop it into the oven. After 45 minutes you should start to smell the sweet roasting aroma, but depending on the size of your bulb, it may need a bit more time. Test by slipping the sharp point of a paring knife into one of the cloves. If it slides in effortlessly, or the bulbs are starting to poke out of their skins, then the garlic is ready. Toss the bread cubes with oil, garlic, and salt. Spread out on a lined baking sheet and bake in the oven at 350 degrees for 8 – 10 minutes, or until evenly browned and crisp on the outside.